Since sis lives in Manila for about 2 years, this is our first time visited her there. Boarded Cebu Pacific Airlines and landed safely at 4.55am. Me and my mom did not see my sis's presence and by all mean, I know that she must be overslept. 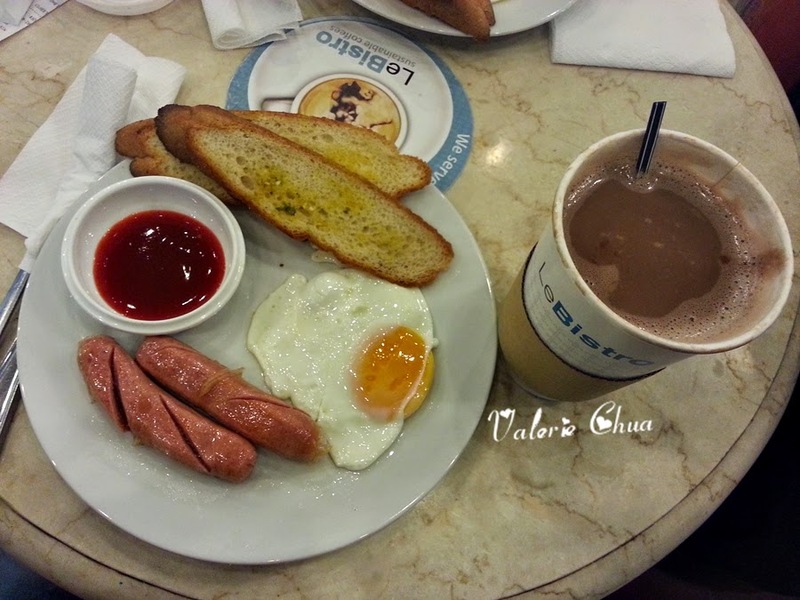 =.=" I was famished and decided to go for a breakfast while waiting for her to pick us up. #1 The first meal in Philippines was taken at LeBistro. I have this habit, which is to order my drink and ask for less sugar. Luckily I did, the hot chocolate appeared to be still sweet. Then I started off with the not-so-good-looking-sunny-side-up egg yolk, and I was waken up by the saltiness. OMG. I can feel a pinch of salt, yes, a pinch of salt sprinkled on the egg yolk. Tell me how many pinches of salt was used on the whole egg then? =.="